Mirror Mirror's Lily Collins - a Role Model Moms Can Approve Of! When I was preparing to fly out to Santa Monica a few weeks ago to attend a press screening of Mirror Mirror, I did a little research on the movie’s main star, Lily Collins. What I found was surprising – in a very good way. You see, while other actresses were all over the tabloids when they were her age, Lily Collins stands out for her lack of drama – and her abundance of class. She is the kind of movie star that I WANT my daughter to look up to and emulate. What makes Lily Collins so special? Well, for starters, she is so ambitious and driven – and in a good way, not a use-her-name-to-get-ahead sort of way. Lily Collins told us during our interview session that she was pitching networks for a teen talk show when she was 16 years old. That takes moxie! While she heard a lot of “No,” Lily Collins didn’t let that bring her down. She told us that whenever she heard “No” she chose to hear “Not right now” and kept plugging along. That is the kind of determination and optimism that I’d like my daughter to have! Whereas many children of famous musicians have coasted by on their parent’s coattails, Lily Collins carved out a career for herself – and at a very young age. 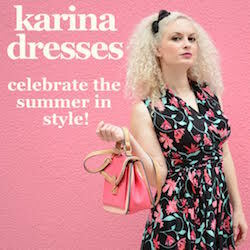 First as a model, then as a journalist (she was one of Nickelodeon’s teen correspondents for the 2008 Presidential campaign), and now as an actress. Oh – and as a singer. Yes, that’s right, Lily Collins sings too! But you’ll have to watch Mirror Mirror to see her sing! And like with everything else that Lily Collins, does, you will not be disappointed in her performance. Lily Collins truly is a triple threat; she has brains, beauty and style. She has been compared to Audrey Hepburn by many, and from my experience of spending a few hours with her, I can tell you that the comparison is accurate. And much like the style icon she so looks up to, Lily Collins is humble. She actually blushed when a fellow blogger spoke about her being compared to Audrey, and told us that it was a huge compliment. 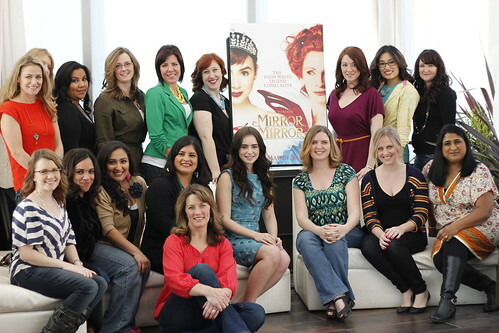 Mirror Mirror really couldn’t be a more perfect actualization of what Lily Collins is all about. Whereas in other Fairy Tale stories, the princess is usually rescued by the prince; in Mirror Mirror, Snow White doesn’t need anyone to save her – she does the saving. Mirror Mirror’s Snow White is a strong woman who learned independence, strength and determination – and THAT is the fairy tale princess I much prefer for my daughter to look up to. In a day and age when young girls don’t have many wholesome famous women to look up to, and TV and film full of garbage idolizing scandalous lifestyles, it is nice to know that I can send my daughter to the movies and know that she will be walking away with a sense of empowerment. You can catch a glimpse of what I’m talking about in this trailer. After returning home from the press screening of Mirror Mirror, I received a box of goodies from the film: a mirrored compact, lip balm, tee shirt, tote bag and a poster from Mirror Mirror. Now THAT is a poster that I am happy to allow my daughter to hang on her wall! I want to say a special thank you to the people at Relativity Media for bringing me out to watch the press screening of Mirror Mirror and the pleasure of meeting Lily Collins. It was a wonderful experience! What a delightful young lady she is. That she has succeeded in a business that isn’t easy to navigate especially as a teenager. I’m excited to see her in this role!